Very Clean Oceanfront Condo with Wi-Fi! 5-Star Vacation! Don't miss a Pacific Ocean sunset from our oceanfront location! Just bring your luggage and groceries to this turn-key, ready-to-enjoy condo! This is not a typical rental as it is also our family's second home so it is kept very clean, comfortable and constantly upgraded (like a 5-star hotel). Come relax and enjoy our home on the beach. Our condo has a direct, oceanfront location and spectacular views can be seen from the living room and master bedroom. Everything is new from our recent remodel - appliances, furniture, two TV's with DVD. It is conveniently located with parking just steps away. This is a ground floor, one story unit so it is very user friendly with no stairs. The condo offers free high-speed internet and also has a rare second patio to enjoy the sun or BBQ. Our complex is the Solana Beach and Tennis Club which has direct beach access so you do not need to pack the car! On the property you will find a pool, two spa's, and two clubhouses complete with table tennis and billiards. We are located on the border of Solana Beach and Del Mar so the activities are endless. Great restaurants are within walking distance. Downtown Del Mar, the racetrack, and the Cedros Shopping District are just minutes away and Sea World, Legoland, La Jolla and the famous Torrey Pines Golf Course (site of the 2008 U.S. Open) are a short drive. Amtrak depot is just three blocks away where you can take the train to downtown San Diego for dinner! Come enjoy a sunset soon with your family! We are happy to answer any questions about our condo or the San Diego area to assist you with your decision. Feel free to email us! Note: Short-stays are subject to a city tax. Summer season has 2-week minimum stay. 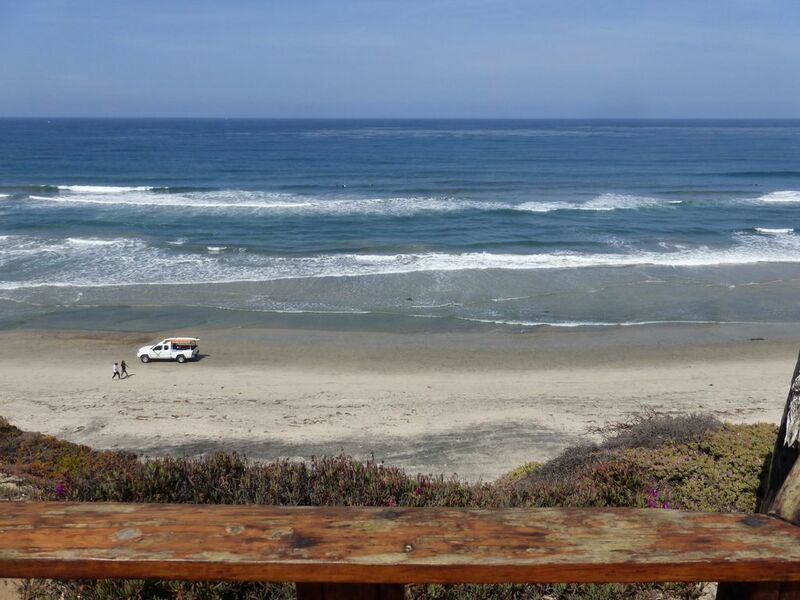 We chose to buy a vacation condo in Solana Beach/Del Mar area because we live in San Diego and believe this area offers the best coast, ocean, and beach town. This is a great area for complete family fun! Our unit is also our second home so we take great pride in keeping it clean and comfortable. Our complex has direct beach access via a staircase down to the sand. Our location is a short walk to restaurants, coffee shop, train station, and a oceanfront park with basketball court. We have welcomed back many return guests to our unit. Fabulous - great location and views! This condo is in a great location with great views. It is very comfortable and clean. We love having the windows open to hear the waves. Love sitting on the deck and watching the waves, the surfers, dolphins and birds. The location is perfect for us. An easy drive into San Diego or La Jolla or up north as well. Great restaurants and shops are close by. Matt's condo had everything we needed and he was readily available if we had questions. Looking forward to our next visit!! Thanks Matt! Fantastic place with incredible views!!! Our family enjoyed our stay even more than expected. Matt was a great host. We felt at home on the very first night as this place has everything you need, the owners did not miss one detail! Solana Beach is fantastic and seemingly nice and private. My daughters loved being on the beach. I will miss my morning coffee with this incredible view! Thank you Matt, you have a wonderful place! This condo is clean and in an excellent location!! The beach below was great for our daughters (ages 9 and 11) to swim and enjoy the sand! There is an outdoor patio with beautiful views of the ocean and everything you will need at the beach!! We could walk to dinner and Matt the owner was so nice to work with and had wonderful recommendations for dinner as well as beaches! This location was close to the zoo, lego land and sea world. Everything was well stocked and they also had a pool that the girls enjoyed! We hope to come back in the future! We stayed at Matt's property for 5 days and absolutely loved every minute! I've stayed at several other rentals over the years and this one by far is the cleanest and most well stocked. The condo remodel is beautiful with everything anyone would need in the kitchen, the bathrooms had plenty of towels and soaps, and the bedrooms had plenty of blankets and pillows. Even the utility closet off the balcony is immaculate and has beach chairs and umbrellas. The view is so awesome!! We had coffee on the balcony every morning and watched the sunsets and stars at night and the surfers and the dolphins during the day. The location is perfect for exploring all the coastal towns. We took the Coaster train downtown which made for a very easy day trip. The property is very, very quiet - we rarely saw other people while on the balcony. Access to the beach is easy through the side gate and down several flights of stairs. I saw many people running the stairs for exercise. The beach is fairly quiet also and is lovely to walk on. Matt met us at the property to give us the tour and details and also checked in with us later to be sure all was well. He has done a fabulous job with the condo to make it a very comfortable home away from home. We look forward to booking another stay here soon! Thank you Matt & Stacey! Believe the description and positive reviews! Our recent stay was perfect. Motivated owner is 100% helpful and available for questions/help as needed. Condo truly is 100% clean with NO wear and tear. Parking is underground, convenient, and very secure. Condo has plenty of room including the fully appointed kitchen. Bedrooms are big and sheets/bedding are nice quality. Condo is fully appointed. The location is awesome. Easy drive to pharmacy/groceries/gasoline. Yes, the condo truly faces directly to the ocean with a great view. Short walk down stairs to the beach. Beach is clean and minimal people, even on the weekend. No negative people/garbage/pollution on beach or condo complex. Thankful this is a non-smoker property. If we get to return to Solana Beach , we will definetly try and rebook this condo. Simply no reason not to, and every reason to book it. Thanks James, it was a pleasure assisting your family. Shopping (Malls nearby), Sea World, Legoland, La Jolla, San Diego Zoo, Historic Old Town, Del Mar Racetrack, Torrey Pines Golf Course. * Discounts available for one month stay or longer. * One complimentary house cleaning with stays of one month or more. * Longer term tenants preferred. Under 30 days requires a city tax charge.